Santa Justa Station, Seville, Spain: From a high ceiling glaring circles of light stare down at rectangles of dark tiles where an ant-bed bustle of jacketed men and women, young and old, push and pull rectangular cubes on wheels, some with backpacks or shoulder bags as well. They meander in and out of malformed lines, some with confident purpose and direction, others seemingly lost, blind mice feeling their way toward one ticket counter, snack shop, gift shop, bookstand, café, or advertisement display to the next, never satisfied. A large group of reluctant gray hairs rumbles in, pausing, awaiting the command of some missing leader, searching out rest one by one on connected rows of metal seats. The women are wearing coats and scarves, the men in jackets and sweaters because the March mornings are still chilly in Seville. There is a muffled chatter full of guttural slurs and lisping aspirations. The women are asking the men if they are sure which train they are supposed to take; and the men, some silenced by uncertainty and doubt, search through bifocals toward black schedule boards where arrivals and departures are spelled out in orange pixeled letters and numbers if only the characters weren’t so small. It is clear that after years of patience and trust in the men they once reluctantly followed, the women have finally arrived at an uncomfortable conclusion of distrust. They close their eyes in anxiety and fatigue and think of their sons in some distant place in whom there is still some faint glimmer of hope. Giant clocks on either side of the station nave glow with hands that crawl slowly through the sludge of persistent time. Dozens of passengers eventually herd out onto the platforms to be swallowed by trains and slithered away toward unimaginable destinies. 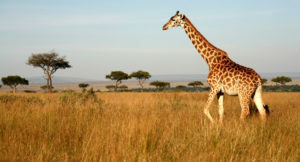 I had two big reservations about our Kenya Safari. Could I stand all the air travel? Could I stand the other tourists in our group? Our itinerary from our home in southwest Florida was: Tampa, Philadelphia, London, Nairobi. Two hours to the Tampa airport from our house, 24 hours on various airplanes and layovers in airports. A total of thirty hours of travel! Nancy has no trouble sleeping on planes. She is often dozing before the plane leaves the gate. I’m not so lucky. I’m 6′ 5″ and 250 lbs. I just can’t get comfortable sitting in an “economy” seat. I loaded up my phone with podcasts, bought an Amazon Fire tablet with audiobooks and games that didn’t require WiFi. I had battery backups to last 24 hours. The plane from Tampa to Philadelphia was an Airbus 320. The seats were OK. I jinxed us by commenting: “If I have this much room all the way, I think I can make it.” I had about three inches between my knees and the seat in front of me. Doable. Even if the seat was reclined. The British Airways segments were all Boeing 474’s. “Jumbo Jets” they used to be called. A plane that has been in the air 50 years. I suspect the planes we were on were among the first to fly. Now they are “Cattle Cars” for economy class passengers. I wear hearing aids. I knew that putting earbuds in with aids probably wouldn’t work, so I packed some old headphones that lay on top of the ear. Not the fancy new over the ear headphones that everyone else had… so they didn’t block out the engine noise. Closed captioning was an option for the first run movies, but it was so small – I couldn’t read it! ARGH. The hearing problem kiboshed my audiobook and podcast options. With the volume set as high possible, I just couldn’t understand. My entertainment for 30 hours +/- of flying consisted of — staring at things. Nancy dozing, the people around me dozing or watching movies/television programs, the back of the seat, the flight attendants. We toyed with the idea of spending a day in London to break up the trip. We did – and it was excellent advice. I may not have made it from London to Nairobi otherwise. The answer to Question 1 is “yes.” The answer to Question 2 is to be determined. Mark Van Patten writes a blog called Going Like Sixty and has been married to the same woman since 1968. What some might call the ideal retirement others can only imagine the horrors of a perpetual buffet line. A startup company in New York, Storylines, is selling cabins on a 584-foot luxury cruise ship to retirees who want to ply the oceans. There are only 302 cabins so you’ll have to act fast. Not. For someone like me who considers being trapped on a cruise ship to be a complete and total nightmare, this all seems like a terrible idea. But I have no doubt it will be a success. Cruise ship condominium owners may rent out their cabins much like the Airbnb model in order to defray monthly fees that range from $4,770 to $9,600. Yes, you read that right. The condo cabins start at $225,000 for purchase and the monthly fees are on top of that initial purchase price. One can only imagine that it’s the cost of 24 hour buffet service that’s pushing the monthly fees into stratospheric levels. Storylines officials say that the fees cover alcohol, housekeeping and other amenities. Hopefully the “other amenities” include a ship’s doctor and medical staff. Somehow I can’t get the mental picture of a floating germ factory out of my head. 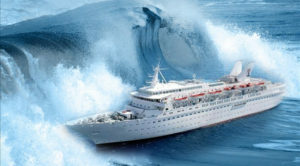 It seems like at least once or twice a year there’s a cruise ship health disaster in the news. You know, the ones where the ship has to return to port after some sort of virus infects more than half the passengers who can only projectile vomit over the railing until the ship docks. Well who wouldn’t want to pay nine grand a month for a shot at that scenario. Baby boomers have a multitude of options for how to occupy themselves in retirement and while cruising is very popular (27 million international passengers are projected for 2018), not everyone has the stomach for it. Literally. Oh, and one more thing. Your ownership is actually a lease that is tied to the “seaworthy life of the vessel.” If the ship runs aground, so does your investment. No amount of life jackets will save you from drowning in debt if that happens. On the bright side, maybe the buffet will continue service. T R A V E L In eastern Canada, southwest winds coming up the Gulf of St. Lawrence are funneled into the Strait of Belle Isle by the terrain of Labrador and Newfoundland. There they meet the Arctic-spawned winds riding south on the back of the Labrador Current, the engine that freezes the strait each winter. 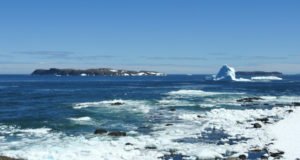 Strong tidal currents, gale-force winds, fog, and seabed-scouring icebergs in varying seasonal combinations produce constant hazardous conditions in the strait. Even on the most beautiful summer day a storm can howl up in minutes. One drizzly afternoon at the little harbor of Pigeon Cove on the Newfoundland side of the strait, I stopped to talk with a man who was walking the shore. He told me he was a deep sea diver who lived near St. John’s, and was laying cable across the strait to southern Labrador. Choppy seas had given him the day off, though he was wetter now than in his undersea work. He said it was a great day for spotting birds, and pointed out several species – all that could be seen – by name. He was also interested in the shore itself, and knew the rocks were limestone with unusual plants. He was going to walk as much of the shore’s ledges and gravels as the rainy day allowed. As we talked, it occurred to me that he must have had one of the most dangerous jobs in the world, his current workplace the cold and turbulent waters of the strait. But he said he loved his work. Obviously having a great interest in the planet, he seemed to be living in, or off of, the interplay of enthusiasm and risk. He was more observant than most of us, with heightened awareness a normal state of mind, and a necessity for his occupation. He might have been an explorer of frontiers in an earlier century. Were I a young man, I might have been intimidated by his extraordinary yet casual competence. But now I am old enough, and content enough, to admire his larger life. I share his enthusiasm, even a bit of the risk, but not at that depth. Richard LeBlond lives in Richlands, North Carolina. Why did I just lock the cabin? Paul Hadella is from Talent, Oregon and he and his wife recently celebrated retirement with a road trip that inspired these poems. turtleneck sweaters and bangs the bongos. food or shining stars to guide us. pretzels in plastic see-through bins. that can serve up to six. ’57 world chumps, who left Flatbush for LA.